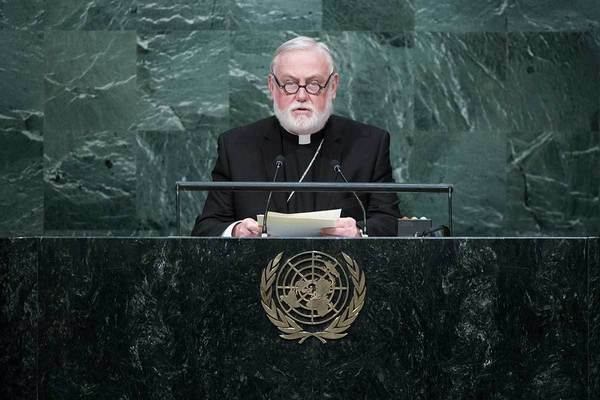 Archbishop Paul Richard Gallagher, Titular Archbishop of Hodelm and Secretary for Relations with States at the Holy See, will deliver the 2018 Keeley Vatican Lecture on Tuesday, October 2nd, at 5:30 p.m. in the Eck Visitors Center Auditorium at Notre Dame. Archbishop Gallagher’s lecture, “The Catholic Church in the European Project,” will be free and open to the public. Paul Richard Gallagher was born in Liverpool and attended St. Francis Xavier’s (Jesuit) College in Woolton. He attended the Pontifical Ecclesiastical Academy and joined the Vatican’s diplomatic service in 1984. In that service Gallagher has held positions in Tanzania, Uruguay, war-torn Burundi and Guatemala, the Philippines, and the Council of Europe. Rev. Gallagher is the first Briton to hold this high a position in the Vatican's foreign affairs. In his capacity as Secretary, he has been an advocate for peace, ecumenism, the abolition of the death penalty, and the importance of freedom of religion and freedom of conscience. The purpose of the Keeley Vatican Lecture is to deepen Notre Dame’s connection to the Holy See by bringing distinguished representatives from the Vatican to campus in order to explore questions related to Notre Dame’s Catholic mission. The series was established in 2005 through the generous support of Terrence R. Keeley (‘81). Past speakers in the series have included Rev. Antonio Spadaro, SJ; Bishop Borys Gudziak; Rev. Friedrich Bechina, FSO; Archbishop Charles J. Brown; Archbishop Salvatore Fisichella; Walter Cardinal Kasper; Archbishop Jean-Louis Bruguès, OP; Reinhard Cardinal Marx; Angelo Cardinal Amato; Archbishop Celestino Migliore; and Dr. Francesco Buranelli; and Archbishop Michael J. Miller. The Nanovic Institute deepens Notre Dame’s connection to the Holy See by bringing distinguished representatives from the Vatican to Notre Dame to explore questions involving Notre Dame’s Catholic mission. Generously supported by Terrence R. Keeley since 2005, a lecture is chosen each year by the Institute in close consultation with its Advisory Board and the Notre Dame administration. The lecture will be live-streamed on this website. After the lecture, we will also post the video on our YouTube channel and Facebook page. Please visit map.nd.edu and select OVERLAY and Visitor Parking to view these areas on a map. The primary Visitor Lot is located on the east side of the Walsh Family Hall of Architecture (currently under construction). The only entrance to the Visitor Lot is off of Holy Cross Drive. Just inside the lot, there is a parking pay station to the right (the NW corner of the lot). Additional visitor parking areas are located in the Joyce, Compton and Baseball Lots. 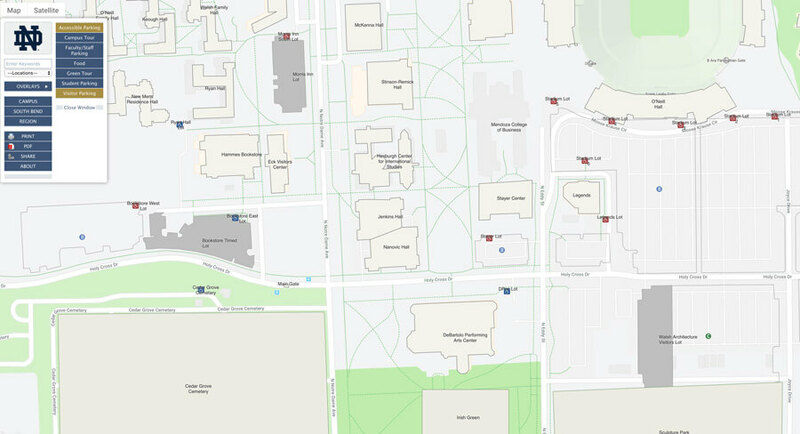 Pay stations to accommodate these areas are located in the Compton Lot (near the bus shelter off of Holy Cross Drive) and in the Joyce Lot (just south of the entrance to Purcell Pavilion). Please click here to see a map showing the location of the pay stations and shuttle routes. If parking reaches capacity in these lots, the permits from any of the pay stations will allow guests or visitors to park in the Dorr Road, Lake or Bulla Student Lots. The permits are valid for non-reserved parking spaces only. No permit is required outside of regular business hours and on holidays. In an effort to make getting to your destination easier, the University offers a complimentary shuttle service Monday - Friday from 7 a.m. to 7 p.m. Busses arrive at designated pickup locations approximately every ten minutes. Please click here to see a map showing the location of the pay stations and shuttle routes. The pay station locations are indicated by the red arrows. For more information on the shuttle program, please visit the Transportation Services shuttle site, here.